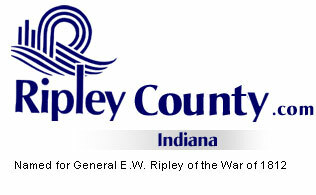 The Ripley County Council met on December 16th, 2003 at the Ripley County Annex in Versailles , Indiana . Don Dunbar, Ripley County Council President called the public meeting to order promptly at 7:00 PM with Council Members Dephane Smith, Juanita Bauer, William Dramann, David C. Simon, Edward Armbrecht and Lawrence Nickell in attendance. This is a public meeting of the Ripley County Council. Neil Comer, Ripley County Attorney was not present for the entire Council meeting. Council Member Smith made the motion to approve the minutes of November 18th, 2003 and seconded by Council Member Simon. Motion approved unanimously. Council Member Nickel made the motion to approve the Emergency meeting minutes of November 14th, 2003 seconded by Council Member Smith. Motion approved unanimously. Neil Comer, County Attorney presented the council with the re-appointment of Douglas Thayer to the Ripley County Department of Parks and Recreation. Council Member Smith made the motion to re-appoint Douglas Thayer to the Board of the Ripley County Department of Parks and Recreation and seconded by Council Member Dramann. Motion approved unanimously. Council Member Armbrecht made the motion to approve the additional appropriation of $5,000 from Adult In Home Detention Fund (Ripley County Probation Department) to Fund# 333-32435-000-333 (to complete this fund to the end of the year 2003) seconded by Council Member Simon. Motion approved unanimously. Council Member Smith made the motion to approve the appropriation of $4,500 from Innkeepers Tax Fund for November 2003 (promotion of Ripley County Tourism-related businesses and events) seconded by Council Member Nickell. Motion approved unanimously. Council Member Smith made the motion to advertise the additional appropriation ( Jan. 2, 2004 ) for Ripley County Highway Department of $339.65 from SISWD fund and seconded by Council Member Nickell. Motion approved unanimously. Council Member Smith made the motion to accept Judge Carl Taul’s request to withdraw for and additional appropriation of $5,000 to Fund# 100-36600-000-020 Pauper Counsel from Fund #279-000-000-020 Supplemental Public Defender seconded by Council Member Nickell. Motion to approve withdraw was unanimous. Council Member Armbrecht made the motion to approve the request to transfer for Ripley Circuit Court of $837.20 from Fund#100-25300-000-020 Office Supplies to Fund #100-36600-000-020 Pauper Counsel seconded by Council Member Simon. Motion approved unanimously. Council Member Dramann made the motion to approve transfer request for Ripley County Highway Department of $10,000 from Fund #201-25700-000-027 Garage & Motors/ $4,000 from Fund #201-28900-000-027 Gas, Oil, Lubes / $4,953. From Fund #201-29100-000-027 to Fund #201-43100-000-027 Equipment seconded by Council Member Simon. Motion approved unanimously. Ripley Circuit Court Judge Taul withdrew the transfer of $2,640 from Fund # 100-36600-000-020 Pauper Counsel. Ripley County Council stated the balances of Encumbrances are to be put back into the Ripley County General Fund. Council Member Armbrecht made the motion to approve the encumbrance for Ripley Count Superior Court/Judge Morris of $397.44 Fund # 100-25300-000-022 Office Supplies (Computer Monitor) seconded by Council Member Dramann. Motion approved unanimously. Council Member Armbrecht made the motion to approve the encumbrances for Ripley County 911/Communications Center/Judy Schebler of $1,200 Fund# 277-11290-000-045 Holiday Pay (Telecommunications Holiday Pay)/ $1,700 Fund # 277-13801-000-045 (Telecommunications Overtime Pay)/ $896.35 Fund # 100-17304-000-018 (Telecommunications Salary/ Donna Million) / $600 Fund # 277-12600-000-045 (Social Security)/ $89.90 Fund #277-25300-000-018 (Office Supplies)/ $341 Fund # 100-32320-000-018 (Training) / $37,787.70 Fund # 277-33180-000-045 (Miscellaneous Receipts) /$23,650.14 Fund #277-4600-000-045 (Verizon Equipment) seconded by Council Member Dramann. Motion approved unanimously. Council Member Armbrecht made the motion to approve the encumbrances for Ripley County Highway Department/ Ripley County Commissioners $4, 559.01 Fund # 201-32490-000-026 (Hanson Aggregates) / $370.60 Fund # 201-32490-000-026 (New Point Stone Company) / $3,613.65 Fund # 201-32520-000-026 (Asphalt Materials, Inc) / $40,863.20 Fund #201-32520-000-026 (Paul H. Rohe Co. Inc.) /$1,282.08 Fund #201-32550-000-026 (Hall Signs) / $960 Fund #201-32520-000-026 (Newman Signs) / $27,055.58 Fund # 201-43100-000-027 (John Deere Credit) / $18,953 Fund # 201-43100-000-027 (Payton Wells Chevrolet) seconded by Council Member Smith. Motion approved unanimously. (Encumbrance of $12,107.58 Fund #201-43100-000-027 (Old National Bank Leasing-Patchier Truck was not approved due to payment not being due till June 4th). Council Member Armbrecht made the motion to approve the encumbrance for Ripley County Probation Department/ Shannon Schmaltz $2548.75 Fund # 333-32435-000-333 (Adult In Home Detention) $84 Fund # 329-32435-000-329 (Juvenile In home Detention) / $207.20 Fund # 100-32703-000-021 (Van Mileage/Maintenance) seconded by Council Member Simon. Motion approved unanimously. Council Member Smith made the motion to approve the encumbrance for Ripley County Health Department/Pat Thomas $98.72 Fund # 214-29550-000-036 (Environmental Health/Staples) / $72.52 Fund # 214-29550-000-036 (Environmental Health/Petty Cash) / 100.20 Fund # 214-34802-000-036 (Environmental Travel/ Andy Bryant) $100.20 Fund #214-34802-000-036 (Environmental Travel/Pat Thomas) / $96.90 Fund # 214-35802-000-036 (Environmental Travel/Traci Bauman) $66.38 Fund # 214-25903-000-036 (Environmental Repairs/ The Office Shop) $18.11 Fund # 245-25302-000-037 (Health Maintenance/Office Supplies/ Pat Thomas) $89.02 Fund # 583-6800-000-583 (BT Grant/Communication/Media Equipment) seconded by Council Member Armbrecht. Motion to approve unanimous. Council Member Smith made the motion to approve the encumbrance for the Ripley County EMS/Scott Melling $1962.50 Fund# 100-36525-000-018 (Tech Electronics -Base Radio)/ $400 Fund# 100-36525-000-018 (Enneking’s Auto-Install Graphics)/$325 Fund # 100-36525-000-018 (Verizon- Phone Install)/$3437.62 Fund# 100-36525-000-018 (Dell-Computers Software)/$372.33 Fund# 100-36525-000-018 (Retzner Oil Co- Fuel Tank)/ $157.30 Fund# 100-36525-000-018 (Verizon Wireless- New Cellular Service)/$38,094.60 Fund# 100-36525-000-018 (Ford Motor Credit- Payoff Vehicles)/ $74 Fund# 100-36520-000-018 (Dec. Co. REMC-Electric Utility )/25,000. Fund# 100-36525-000-018 (Contractor-Garage)/ $142.50 Fund# 100-32705-000-018 (Scott L Melling- Mileage Estimate)/ $30 Fund# 100-36520-000-018 (Scott L Melling-BMV Reimbursement)/ $50 Fund# 100-36520-000-018 (Hoosier Water-Water Utility)/$56.81 Fund# 100-36520-000-018 (Margaret Mary Hospital-Drugs)/ $250 Fund# 100-36520-000-018 (Tech Electronics-Radio Install) and seconded by Council Member Dramann. Motion approved by (6) Six Council Members and (1) Opposed. (Armbrecht). Council Member Bauer made the motion to approve the encumbrance for the Ripley County Highway Department-County Commissioners $1,352.80 Fund# 201-32550-000-026 (Michael Todd & Co. Inc.)/ $5,532.99 Fund# 201-32520-000-026 (Hall Signs) and seconded by Council Member Armbrecht. Motion approved unanimously. Council Member Smith made the motion to approve the encumbrance for the Ripley County Department of Parks & Recreation $84.32 Fund# 425-34400-000-050 (Phone -Cingular)/$387.19 Fund# 425-33370-000-050 (Electric-Cinergy)/ $55.50 Fund# 425-32770-000-050 (Dumpster-Best Way Disposal)/$400 Fund# 425-36103-000-050 (Cinery –Electric Upgrade on building#14) $139.20 Fund# 425-36103-000-050 (B & C Rental)/ #34.26 (Wal-Mart- payable to Darla Westerfeld) $22.10 (Sam’s Club- payable to Darla Westerfeld $19 (Laughery Valley Co-op) $100 (William Dramann) $11.97 ( Rainbow Books & Gifts) $5.89 (Halcomb Home Center)and seconded by Council Member Armbrecht. Motions approved by (6) Members and (1) abstain (Dramann). Council Member Armbrecht made the motion to approve the encumbrance for the Ripley County Sheriff Department (Bill Davison) $2,088.04 Fund# 100-13801-000-007 (Holiday Pay)/ $2,228.92 Fund# 100-13801-000-014 (Over Time Pay) $1,513 Fund# 100-13801-000-007 (Operation Pull Over Grant) and seconded by Council Member Nickell. Motion approved by (6) member and (1) abstain (Dramann). Council Member Armbrecht made the motion to approve the encumbrance for the Ripley County Jail (Bill Davison) $156 (Southeastern In Glass & Block) $90.01 (Halcomb) $203.98 (Halcomb) $2,170 (M & S Machine & MFG) $33.88 (Halcomb) $1,575 (Myers TV) $12 (Halcomb) $36.02 (Halcomb) $1,578 (Enhance Business) $5.99 (Halcomb) $135.06 (Halcomb) from Fund# 288-36104-000-288 and seconded by Council Member Simon. Motion approved by (6) members and (1) abstain (Dramann). Council Member Armbrecht made the motion to approve the encumbrance for the Ripley County Sheriff Department (Bill Davison) $2.99 Fund# 251 (Spencer Tyson) $8.64 Fund# 100-28200-000-014/ $19.99 Fund# 100-28200-000-014/ $30.17 Fund# 100-28200-000-014/ $57.06 Fund# 100-28200-000-014/ $15.57 Fund# 100-28200-000-014/$24.52 Fund# 100-28200-000-014/ $7.01 Fund#100-28200-000-014/ $20.87 Fund# 100-28200-000-014/ $431.49 Fund#100-28200-000-014/ $30.05 Fund# 100-28200-000-014/ $10.87 Fund# 100-28200-000-014/ $255.30 Fund# 100-28200-000-014/ $16.98 Fund# 100-28200-000-014/ $218.94 Fund#100-21800-000-014/ $27.16 Fund# 100-32301-000-007 (Office Shop)/ $80.86 Fund#100-37501-000-014 (Sheriff’s Petty Cash) $247.12 Fund#100-37501-000-014 (E W Brockman) $62.10 Fund# 100-32380-000-014/ $147.50 Fund# 100-37501-000-014 (Fries Brothers) $59.50 / $451.22 Fund#100-25700-000-007 (Retzner Oil)/ $244.98 Fund# 100-33800-000-007 (BP Oil)/ $257.56 Fund# 100-36102-000-014 (Master Card)/ $321.72 Fund# 100-33800-000-007/ $219.78 Fund# 100-34100-000-007/ $25.34 Fund#100-28200-000-014 (Wal-Mart)/ $315.71 Fund# 100-37501-000-014 (Super Valu)/ $407.35 Fund# 100-37501-000-014/ $71.92 Fund# 100-34100-000-007 (Quill)/ $10.04 Fund# 100-33600-000-007 (Bill Davison)/ $630 Fund# 289 (CDA Inc.)/ $110 Fund# 262 (ISA)/ $83.94 Fund#291 (Cintas)/ $30.30 Fund# 100-33800-000-007 (BP Oil)/ $73.26 Fund# 261 (Master Card)/ $25.65 Fund# 100-33800-000-007 (Shell Oil)/ $18.73 Fund#100-33800-000-007/ $23.40 Fund# 100-33800-000-007 and seconded by Council Member Simon. Motion approved by (6) member and (1) abstain (Dramann). Council Member Armbrecht made the motion to approve the encumbrance from The Ripley County Commissioners $15,173.05 Fund# 288-36104-000-288 Cumulative Jail Fund (Finish Old Jail Revocation) and seconded by Council Member Simon. Motion approved unanimously. Council Member Armbrecht made the motion to approve the encumbrance for the Ripley County Commissioners $24,000 Fund# 100-39650-000-018 (Safe Passage) and seconded by Council Member Smith. Motion approved by (4) member (Smith, Armbrecht, Dunbar & Nickell) (3) members were opposed (Bauer, Dramann & Simon). Soil & Water appeared in front of the Council with concerns over the 2004 budget. Council explained that the salary ordinance had to reflect the total salary and also asked for the balance back on the $10,000 grant for Tech Assistant that was not used for 2003. Council President presented a letter from The Ripley County Department of Parks & Recreation stated that they did not want to increase the wages of the Park Manager & the Park Caretaker due to the two employees are part time workers and that they are satisfied that the current wage is sufficient and fair compensation for their work. Council Member Armbrecht made the motion to appoint Mr. Robert Gindling to the ABC Board and seconded by Council Member Smith. Motion approved unanimously. Council Members had no reports. Council Member Smith made the motion to adjourn to the next meeting on Friday, January 2nd, 2004 at the Ripley County Annex and seconded by Council Member Armbrecht. Motion approved unanimously.